LG’s new flagship focuses on the essentials. As much as I liked LG's V30 and G6 last year, numbers don't lie: The company's latest earnings show just how tough the smartphone business is. So what kind of approach would LG take this time around? Play it safe or go bonkers? Well, in the end it was a bit of both. 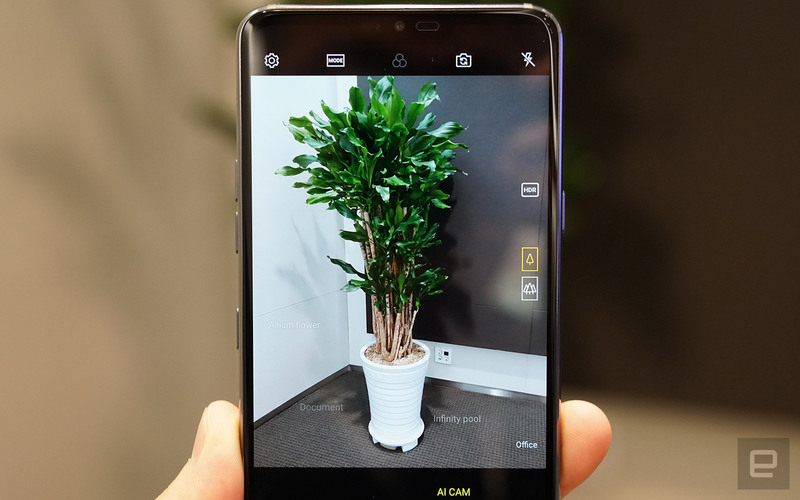 With the V30S ThinQ, LG started planting its seeds in the machine learning field, and gave us the first taste of its AI-assisted camera. But barring that, the V30S ThinQ was largely identical to its predecessor. 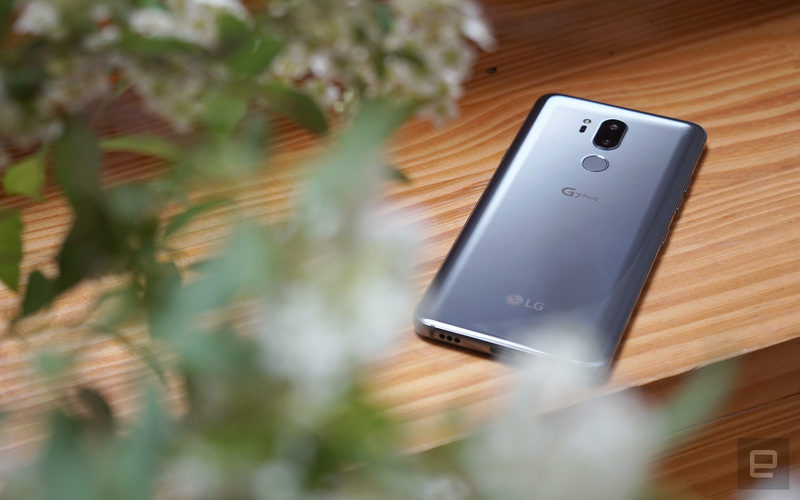 It did give LG a couple more months to polish its latest flagship, the G7 ThinQ, which focuses on delivering the brightest display, the loudest sound and a more powerful AI Cam. Yes, there's a notch, too. Let's get the main specs out of the way. As you'd expect from a flagship device these days, the G7 is powered by a Qualcomm Snapdragon 845 chipset -- a forward-thinking move compared to how the G6 went with an older, slower processor than its rivals. Depending on your region, you may get both the base model with 4GB of RAM plus 64GB storage, and the G7+ ThinQ with 6GB RAM plus 128GB storage; both support microSD card expansion of up to 2TB. There's also a familiar-looking camera bump plus a fingerprint reader on the back, though the latter no longer serves as a power button -- you'll have to use the new dedicated button on the right. LG, which has avoided the usual power button placement until now, said this change came from users that said the two-in-one button was too sensitive. Besides, users can set up the new power button to quick launch the camera app with a double-tap, which I find far more convenient than turning on the screen for the shortcut icon. Speaking of, there's yet another new button positioned below the volume keys on the left: the Google Assistant Key. LG approached Google with this idea, and the result was a button that offers three input modes for Google Assistant: click once for the usual voice input; press and hold to talk to Google Assistant as if you're using a walkie-talkie; and double click to toggle visual recognition. And yes, all three input methods let you skip the "OK Google" command. I'm already starting to enjoy this more straightforward approach -- it's just less dorky. But should you wish to use that same old voice command to toggle Google Assistant, the G7's dual-mic "Super Far Field Voice Recognition" can pick up one's voice from up to five meters or about 16 feet away -- even in noisy environments, supposedly, but I didn't get the chance to try this myself. Even though Samsung's Bixby button might have been the inspiration for this addition (not that LG would admit), chances are you'd be more likely to use LG's offering given how much more powerful Google Assistant is. Still, if you're not a fan of this feature, while you can disable the button, you can't remap it. Despite the name, the G7 inherited many qualities of the V30 series in terms of look and feel, especially with the shiny finish, curvature, the shape of the camera bump and the screen's rounded edges. If, like me, you're already a fan of the V30, then you won't be disappointed with the G7 when you get one in your hands. While the G7 may not look as rugged as the G6, both devices -- along with the V30 series, for that matter -- have the same IP68 certification plus 810G military standard rating, so there's apparently no sacrifice in durability for this prettier look. I got to see all four colors -- "New Moroccan Blue," "New Aurora Black," "Raspberry Rose" and "New Platinum Gray" -- and personally I'd go for either the blue or red. I wouldn't be surprised if the G7's design was originally intended for the V40 or some sort of V30 variant, but there's one key component that draws the line between the V series and the G series of late: the display. LG decided to stick with a 6.1-inch QHD+ LCD instead of the OLED found on most flagship smartphones in 2018. 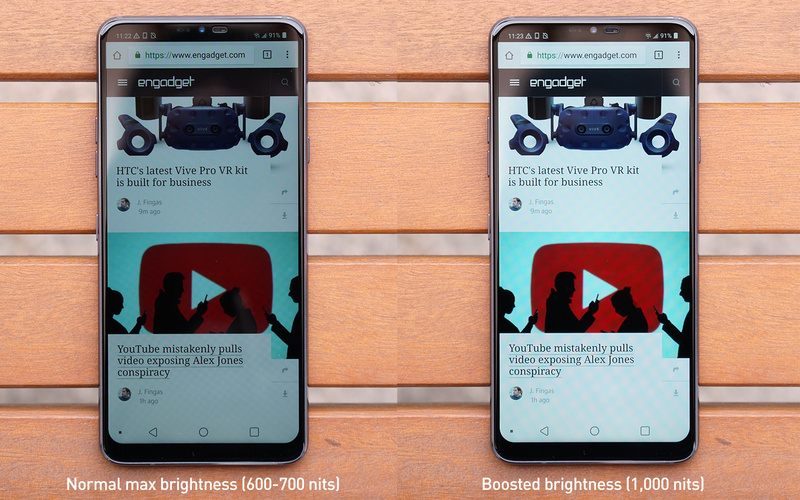 But that's not a bad thing: When placed side by side, the G7 made the G6's LCD look, quite frankly, dull, and it was almost as vibrant as the OLED screens on the iPhone X and Galaxy S9. In technical terms, LG says this LCD panel covers 100-percent DCI-P3, or 135-percent sRGB, color gamut. What this all means is that it's a huge leap forward from the G6's screen tech, even if both are LCD. But the real selling point of this "Super Bright Display" is its 1,000-nit brightness for outdoor use. There's a "Boost" button next to the screen brightness slider in the notification drawer to toggle this maximum brightness setting, and this will maintain the 1,000-nit level for three minutes before it gradually dials back down. This is both for the sake of battery life as well as to avoid overheating. It also gives your eyes ample time to adjust to the sunlight. It certainly worked well during my time with it in direct sunlight: This phone was made for using outdoors. As for power consumption, LG claims that, at 500 nits, the G7's LCD actually uses 30-percent less power than most of the competition. It has nothing to do with a new backlight, but actually the RGBW pixel arrangement on the panel, with an extra white sub-pixel involved with all that extra brightness. It's not the first company to experiment with sub-pixels this way: Sony once tried a similar display tech on the Xperia P back in 2012. Alas, LG has used these power savings to justify shrinking the G7's battery compared to its predecessors. In order to keep the 162-gram weight and 7.9mm thickness, there's a 3,000mAh battery -- both the V30 and the G6 had a 3,300mAh cell. Well, at least there's still Quick Charge 3.0 as well as wireless charging. We will have to see how this smaller battery holds up in our upcoming review. Now, don't worry, I haven't forgotten the notch. LG cheekily calls this the "New Second Screen," because it wants to remind you that well before the notch trend, it already had a tiny secondary screen on the V10, V20 and Q8. 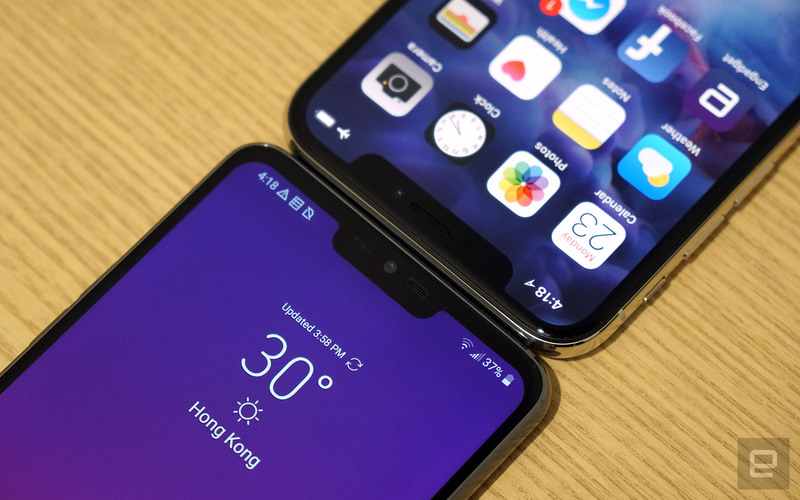 LG may have ditched this feature eventually, but the notch display offers something similar once again; plus you can always hide the notch with a black bar or a gradient background. Another highlight of the G7 is its "Boombox Speaker" feature, which claims to be ten times louder than the competition. While I didn't have the right equipment to fact-check LG's statement, the G7's speaker was indeed very powerful. It easily blew other smartphones away, including the iPhone X, the Galaxy S9+ and some earlier LG devices that were also part of my demo. I can confidently say that the G7 is the loudest smartphone I have ever come across, and what was more surprising was that it was all coming out of a single driver -- not two -- within the device. The trick? It's all about expanding the speaker's resonance space to help further amplify sound waves: Instead of using a conventional speaker module's own tiny chamber, the acoustic engineers at LG realized that, given the phone's internal waterproof sealing, they could simply expose the speaker driver to the entire space within. The result is eight cubic centimeters of resonance space inside the G7, which is about 17 times larger than the speaker modules found in LG's recent smartphones. Better yet, the speaker unit is also 39 percent larger than before. Thanks to the extra bass, the G7's body can also act as a passive sound radiator and take advantage of any hard surface it comes into contact with -- be it a guitar, a random wooden box or even just a desk. Obviously, the overall sound quality will vary depending on the surface, but in general I found these pairings to sound richer and more rounded than listening to the G7 by itself. I ended up having fun placing the G7 on random surfaces to see what the combination sounded like. The guitar was my favorite. Of course, the effect isn't comparable to real Hi-Fi speakers, and I would actually recommend against blasting out music at full volume when you're holding the G7 in your hand. There was some distortion as I pushed the speaker to its limit at that point, but I was fine with it after dialing it down by one or two clicks. 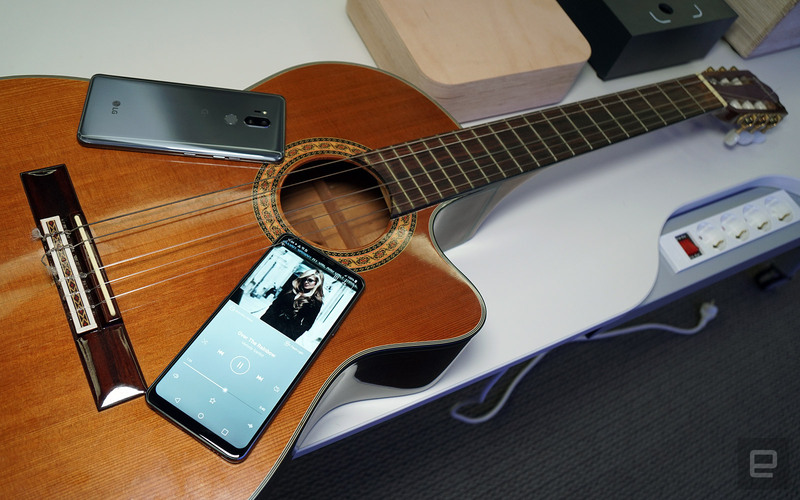 Placing the phone on a desk, on the other hand, made the louder playback more tolerable thanks to the additional bass response -- a 15 to 20 dB improvement in performance, by LG's measurements. The 3.5mm headphone jack is here to stay at the bottom, and this is still powered by a Hi-Fi quad DAC to satisfy audiophiles. The G7 also happens to be the first smartphone to support DTS:X, which delivers virtual 3D surround sound at up to 7.1 through any pair of headphones. Last but not least, the cameras. On the front, LG finally upgraded the selfie camera from 5 megapixels to 8 megapixels (f/1.9, 80 degrees), and in my quick side-by-side comparisons, the improvement was certainly noticeable. The colors were accurate, and my hair, eyebrows and skin looked well-detailed, to the point where I had to switch on beautification to hide some of my flaws that day. 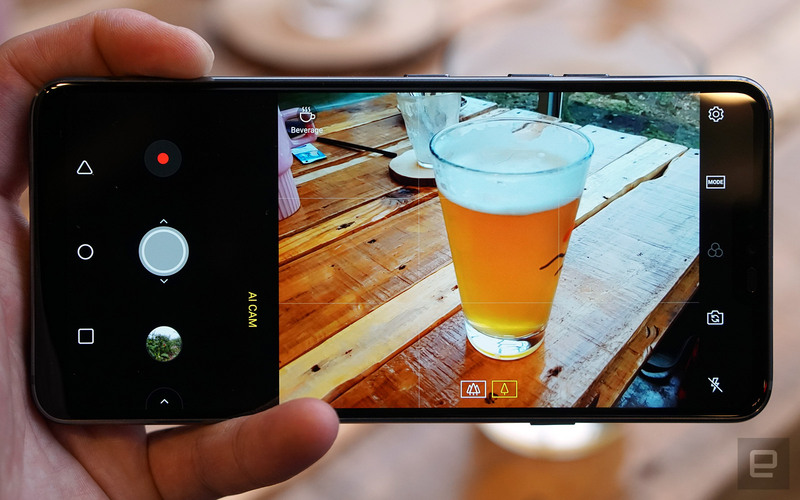 Flip to the back and you'll find a pair of 16-megapixel cameras, both with Sony's IMX351 CMOS sensor -- the same imaging chip inside last year's V30. The difference between the two cameras inside the G7 is that the main imager has an f/1.6 aperture and optical stabilization, whereas the secondary camera jumps to f/1.9 along with a 107-degree super wide angle. While the super-wide camera here may appear to be a downgrade from the G6's 125 degrees and the V30's 120 degrees, LG says it's focused on delivering super-wide photos with minimal distortion. Based on the few shots I took, it seems that LG has achieved just that. In low light situations, both of the G7's rear cameras can toggle a Super Bright Mode which sounds very much like the Bright Mode on the V30S, but apparently delivers twice as much brightness thanks to further optimization all round. This feature combines four pixels into one -- aka pixel binning -- in order to boost sensitivity. It does mean that you'll end up with 4-megapixel shots instead of the full 16 megapixels. This isn't exactly a brand new concept -- we saw a similar execution on the second-gen ASUS PadFone Infinity back in 2013. What's definitely new this time, however, is that LG has applied this to video as well, which uses 4K capture to produce optimized 1080p footage. We'll be taking a closer look at these when we get hold of a final unit. Building on top of the eight AI Cam filters found on the V30S, LG teamed up with computer vision company EyeEm to add eleven more to the G7: Baby, Animal, Beverage, Fruit, Sky, Beach, Snow, Group of People, Lowlight, Night Sky and Text. The machine learning engine is trained to recognize 1,162 possible objects, and it tags each image with the appropriate "QTags" -- you can see them floating around in the viewfinder when the camera is "thinking" -- for sorting into up to 155 smart albums. In use, it enhanced photos of food, city, beaches, flower, fruits, people and animals just fine in most cases, though it did struggle between "Animal" and "Pet" when I pointed the camera at a cow. Sure, it's a difficult test, but I preferred the "Pet" mode's more natural colors, anyway. My only complaint so far is that the camera tended to switch to "Sky" a lot when I was trying to capture general landscape, and the unnaturally blue sky stood out like an eyesore. LG did say that it will continue to improve the performance of its image classification engine over time, so hopefully this won't be an issue in the near future. 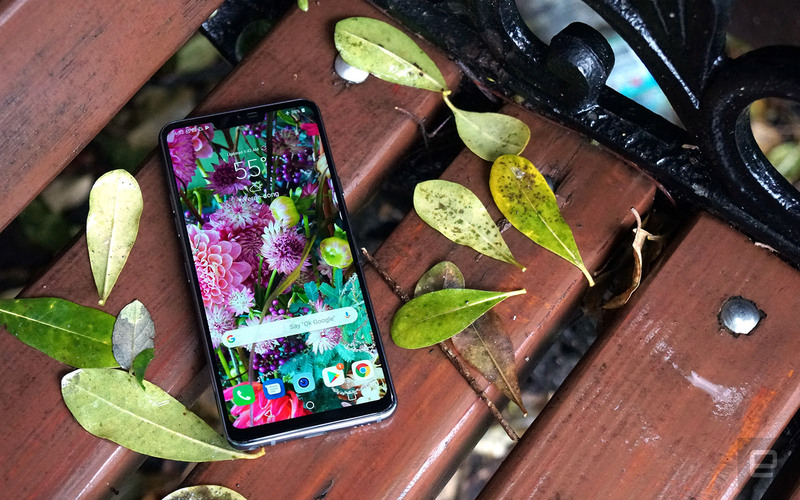 The G7 ThinQ is the most ambitious smartphone from LG since its modular experiments in phones. Its innovative (and loud!) speaker and super bright display are pleasant upgrades and the G7's dedicated key for Google Assistant is already far more appealing than Samsung's Bixby button. As for the AI Cam, it's still a work in progress, but I do enjoy the results when it delivers on its promises.